Michael Burstein stands out in whatever group he's in. Among science fiction writers, the Brookline-based Burstein is in that select group who has had his work nominated for the prestigious Hugo Award, the field's equivalent to the Oscar. He has just received his third such nomination in the short story category. The winner will be announced at this summer's 57th annual World Science Fiction Convention in Melbourne, Australia. At the Cambridge School in Weston, where Burstein teaches science, math, and the occasional science fiction course, he is not only a teacher, but an advisor to the school's student publications. It's not every advisor who can lay claim to the John W. Campbell Award, a prize given to the best new writer in science fiction. However even in the science fiction field, where the 29 year old writer is regarded as a comer at the start of a promising career, Burstein stands out for another reason: he's a practicing Jew. 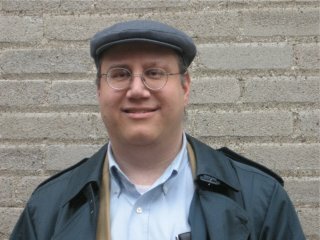 "Just being Jewish doesn't have a lot of impact because there are a lot of people in the world of science fiction who are Jewish," he said, "Being observant, on the other hand, is very interesting." Burstein appears at a number of science fiction conventions throughout the year, which can be a problem because they are inevitably held on weekends. "It can be difficult, but it is manageable," he said. He and his wife Nomi either bring kosher meals or arrange to have them delivered to the hotel. Other issues are more complicated. "One of the biggest problems is that a lot of hotels use electronic key cards," he explained. Burstein arranges with a non-Jewish friend to handle unlocking his room during Shabbat, when such usage might not be deemed appropriate. There are a number of Shabbat-observant fans at local science fiction conventions, and they often congregate in Burstein's room for a festive Friday night meal, complete with wine and challah. As for his science fiction, Burstein said there's been nothing particularly Jewish about it... so far. His first published story with a deliberately Jewish character will be out this fall in ANALOG, the science fiction magazine where much of Burstein's work appears. In "Reality Check," an Orthodox physicist at MIT has to go to Texas and deal with being observant without the support of a large Jewish community around him. The novella is part of Burstein's "Broken Symmetry" series involving a pathway to a parallel universe which he is currently developing into a novel. The first story in the series got Burstein his second Hugo nomination. He was also nominated in 1996 for "TeleAbsence," his very first published story. His most recent nomination was for a story in the June 1998 ANALOG entitled "Cosmic Corkscrew" where an unnamed narrator travels back in time to meet one of the most famous of all science fiction writers -- and one of Burstein's literary heroes -- Isaac Asimov. In it the narrator meets a teenage Asimov who has just written his first short story, "Cosmic Corkscrew," in order to get a copy of it. In real life, Asimov had written such a story but it never sold and is now lost. Burstein met Asimov on a number of occasions prior to the latter's death in 1992, and he said one of his great regrets is that both his father and Asimov died before he made his first professional sale. Burstein dedicated the story to the memory of his father. Although there are many Jews who have made it big in science fiction, including Robert Silverberg, Harlan Ellison, and Asimov himself, Burstein is one of the few who has succeeded in the genre who takes his religious obligations as seriously as his scientific ones.